Today I went to my friend Tom PA2TSL, who owns a complete man cave filled with top-of-the-line test equipment. 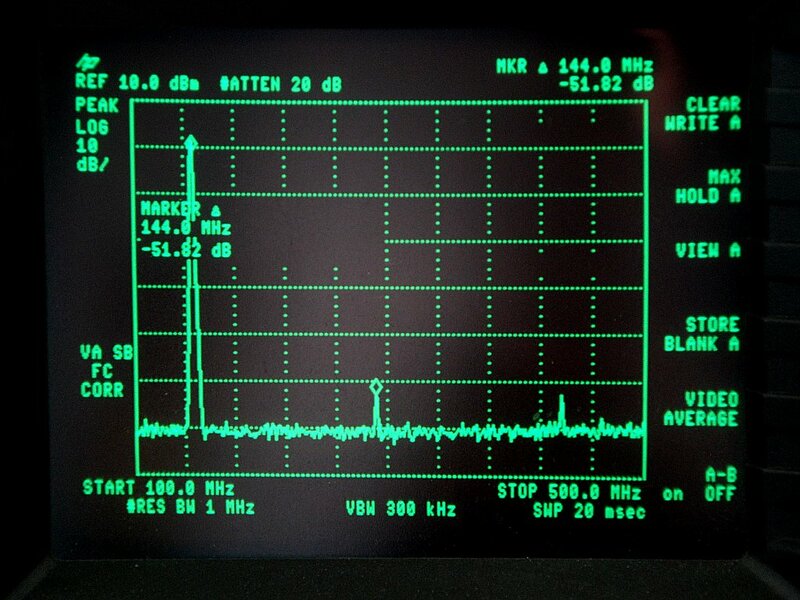 After a complete charge, the UV-5R was connected to the HP 8590A spectrum analyzer, combined with a 30dB attenuator, the HP 8498A. 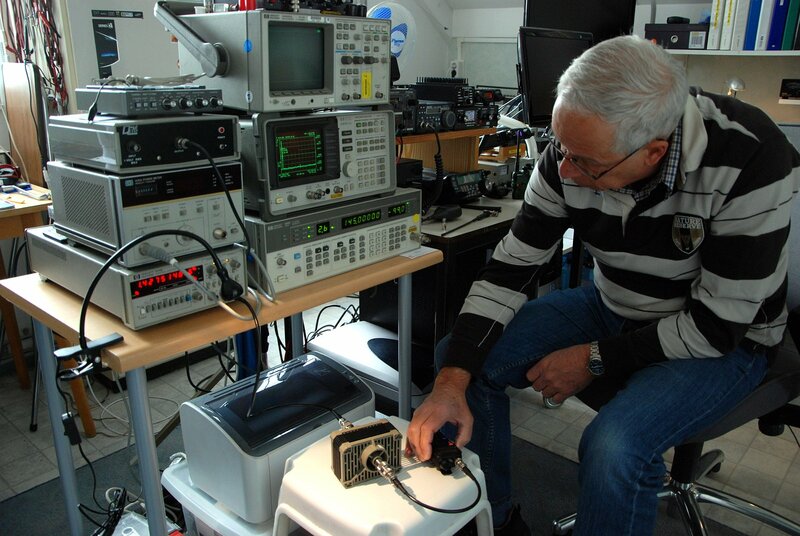 PA2TSL while testing the sensitivity of the UV-5R. The Baofeng UV-3R confronted us with something we didn’t want: spurious emissions. Some HAM operators argued that this was no big deal, given the low power output and small antennas. My opinion is that, regardless of antenna’s and the way we’re supposed to use it, a transmitter should be clean. Again, the UV-5R showed that Baofeng learned something from the past. Below are pictures of the measurements. My first impression was that the sensitivity was on par with the big names. The numbers confirm this. 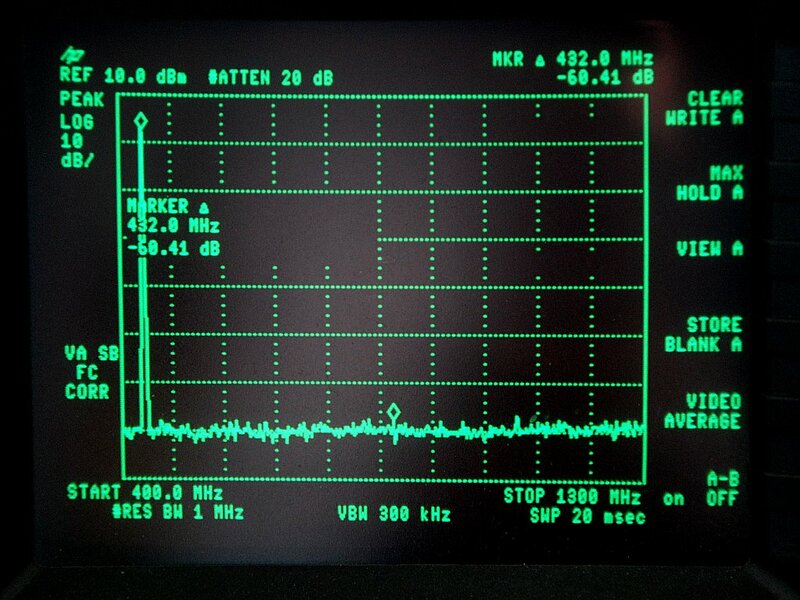 On VHF, 145MHz, the Baofeng UV-5R started to pick up signals at -129dBm. 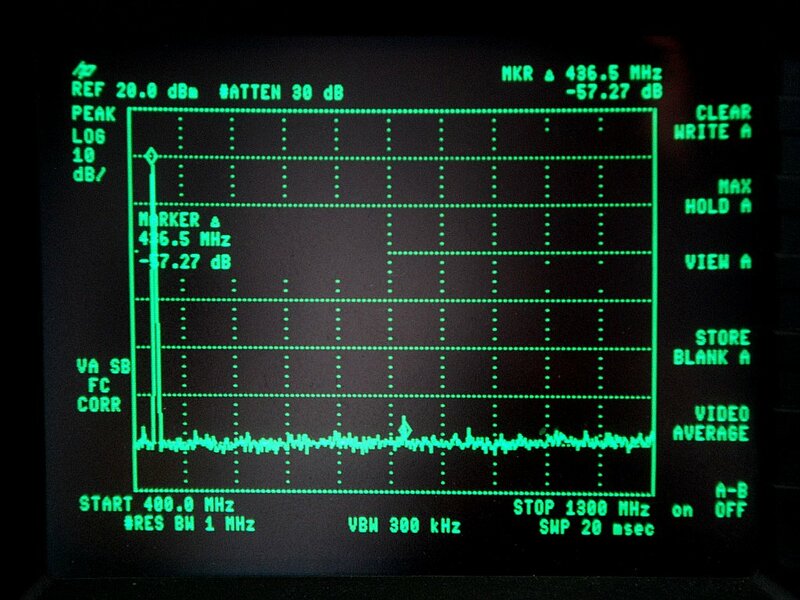 On UHF, 435MHz, the receiver came to life at -126dBm. When it comes to selectivity, the (positive) differences with the old UV-3R are impossible to miss. When connected to an outdoor antenna however, the receiver will collapse quickly. We discussed this finding for a moment and concluded that this is unfortunate, but hardly important. A handheld is a handheld, not a replacement for an expensive dual band transceiver. There’s a rumor floating around that the receiver of the Baofeng UV-5R is off frequency. We could not confirm this; both transmitter and receiver were spot on. Tom’s equipment even added a few extra digits to my measurements, but we all we could find was a meager difference of 44Hz. Please keep in mind that we’re talking FM here! The S-meter isn’t one. Full deflection all the time, regardless of the signal strength. At best it’s a visual confirmation of the squelch being opened. Oh well, I never look at them anyway. The manual isn’t one either. Prepare for some frustrations. Yes, there are some flaws to report, but these aren’t deal breakers. Knowing the Chinese manufacturers (they listen! ), these will probably be fixed in later versions. More flaws will surface along the way, no doubt about that. All said and done, I must say that I like the UV-5R a lot, especially with the price (around $55) in mind. A keeper for sure, and I think I’ll order a few spare batteries today. These won’t break the bank either. Excellent report Hans (and your English is ‘too perfect’ If you ever want to make people think you are English you will have to make more mistakes…) I’ve had my UV-5R about as long as you and agree with your comments. The only thing not noted is that my charger shows red with green flashes at about one second intervals when charging. The battery weighs 80gm compared to 84gm for an ICOM E92D pack so I think the true capacity is probably slightly less than the 1620mah claimed for the ICOM pack. Enjoyed this write up, you get what you pays your money for and takes ones choice. But the UV-5R does still represent an excellent buy! Amateur radio has never been so cheap to get into, I only wish this stuff had been around when I started in the hobby all those years ago. Even though this radio needs a few minimum flaws correcting, Rome was not built in a day, but I guess the Chinese will soon be on case, they are only too alert to rest on their laurels. Yes I did buy one before seeing this, and I also have the various variants of the smaller model the UV-3R MK1, 2,and the Plus. Again learning and improvements have been made in a short time as the model has matured. Reading everything online on this radio (received 2 yesterday) still leaves some questions open on several menu’s and how to program the 25 FM (88-108) radio channels. One of them has a weird bug: when the programming cable or headset is insert, the main speaker isn’t muted as it should be. No deal breaker, but a bit weird. Thanks for the review, it helped me make my decision to purchase one. I am very happy with the unit, but frequency programming via keyboard is tricky and frustrating until you get used to the odd memory store sequence. While you cannot key in the last decimal directly, you can adjust to the exact frequency using the up or down arrow as long as the frequency step via menu number 1 is appropriate, I set the value to 2.5 to accomplish this. 1) I found memory programming easier when I changed menu numbers 21 and 22 to “FREQ” so that the frequency is displayed for channel memories when you access them. It makes verifying frequencies after programming much easier. 2) Scanning by default does not stay on channel more than a few seconds even if the transmission is not finished. This is controlled by menu number 18 which defaults to “TO” (timeout) You can make the scanning stay on channel for the duration of the signal if you change menu number 18 to “CO” (Carrier operation). Good one Greg. I’ve not seen your tips anywhere else yet – they are very useful. question: what is the third “se” mode in menu 18? SE means stop scan and stay on channel. leuk verslag Hans. Die chinezen leren snel….. Very good that you wrote down this test and also the specs. It decided me to order also this porto. Also the tips from other readers will be helpfull, thanks guys! Johan-PE9DX. I do not know about the rules in the European countries, but it does comply with the FCC requirements. 51 DB of suppression is pretty good and the rules a too strict if it requires more suppression than that. The UV-5r looks to be a nice and cheap rig with till so far reasonble good performance. But onto the other hand it does not cofirm to FCC or European CE rules. According the Dutch Telecom the spurious suspression is a bit to low. I wonder if we are allowed to buy and even use this it at all. So far I know only the Wouxun radio’s has the right specifications according the rules of our telecom. Two things:, one, the BCLO does not stay programmed from the keypad. It shows to turn on but looking back it is still off. Two, can’t get the display to display only one band operation, always two. Any thoughts? The BCLO and related menu items are quirky at best. The way they work doesn’t make any sense at all. There’s no way to force the UV-5R into one band mode. Hallo Hans en Tom,leuk item over de Baofeng uv-5r,ik moet eerlijk zeggen hij is elke euro waard,enkel in mijn beroep rijdend op de amsterdamse metro,gaat de ontvanger plat op de (AM) vonkstoring die het voertuig teweeg brengt,de am onderdrukking is minder dan de wouxun 2/70 die daar nagenoeg geen problemen mee heeft. De Baofeng uv-5r vindt ik wel een aanrader,klein en licht goed geluid,goede FM radio,tja wat wil je nog meer voor die centen! Thank you for your reviews they were most helpful to us and we now have ten of these radios for use as business radio coms in video and film production. I find them easy to use and programme via the software and add channel names etc, it is also useful to lock the memories out for production staff who like to fiddle with the channels. If I’m way out in the sticks, what kind of aftermarket antenna would you recommend for transmitting/receiving on 462mhz? 462MHz, that is FRS/GMRS territory. Most popular dual-band antennas will do reasonably well, but they’re not optimized for that range. So, the question is: do you want to use the UV-5R within that frequency range only, or keep the dual-band functionality? If you want to keep using the radio on VHF also, the famous $3.79 antenna will be your best bet. If you plan to use the UV-5R for the 460-480MHz range only, look for a Kenwood UHF (replacement) antenna. I found one here, but there will be USA sellers too. Hans, do you have one of these “famous” antenna’s on your UV-5R? If so, how does it compare to the stock antenna? Yes, I have. Actually I stored the original antennas. The $3.79 antenna is better on average. User reports are positive, but results vary. The latest batch I received did noticeably better on 70cm. On 2 meters the difference is hard to tell. Is this a legal device in the netherlands for those without radio exam? You’re allowed to buy one and own one. However, you’re not allowed to use one without a license. Crazy huh. Haha, that is quite weird. Time to start learning for the F exam. I think nobody would care if you replace a faulty Motorola by a Baofeng. Nobody would notice either. Just program the right CTCSS code (136.5 Hz if I remember well) and you’re in business. Only commerical pirate stations (FM, MW) are at risk of getting caught nowadays. And, can you maybe explain why you’re allowed to buy and own one but not use it without license? They said a new one is in order, 3 months ago… In any case, thank you for the explaination! I enjoy reading the site. I have seen a few times you have written these Baofeng uv5r (and similar) HTs are pretty much basic SDRs, and the majority of their functionality resides in firmware. I find this very interesting because I am a career computer geek and recently became re-interested in radio and got my amateur/ham ticket a couple of years ago after being completely absent from the radio hobby for some 35 years. If these radios are SDR radios, then somewhere there are developers writing the code for these things. I have done some embedded firmware in my time, and consider it one of the more enjoyable types of programming I have done to put bread on the table. I guess I am saying there’s got to be a tool chain out there, probably open source, that could be used to re-engineer the firmware to make it do more of what we amateurs and other customers would like to see a handheld tranciever do. Writing scanning firmware that works –EXACTLY– the way you think a scanner ought to work. Etc etc. The possibilities are kind of astounding. Do you know of anyone who has reverse engineered the firmware authoring process at all? The lack of logic was frustrating. Honestly it seems like much of the firmware is well intentioned but completely misunderstands what the user might want to do, or why. I am sure the programmers are given strict instructions, and deliver on those instructions. But if you could design a radio user interface, I bet you would make a place for every knob and switch in the user interface to completely eliminate nested menus leading to options which are badly explained in a manual. Why not do that in software? Hello Hans, I was wondering if the UV-5RA could be connected to an external, handheld dual band YAGI for Amateur Satellite RX/TX or if there would be any receiver overload in this radio. I have a 5RA with firmware 293. I was blown away that within an hour of unboxing this radio and programming a satellite downlink freq in that I was picking up satellites with my stock antenna. Did not try to transmit though. Any input would be greatly appreciated. I also would like to know if a FM data mode cable for something like FM packet would work by eliminating the TNC and just using the baofeng’s VOX feature to switch between Tx and RX. The only way to fond out is to try it. At my QTH the UV-5R is overloaded immediately on 70cm, but I live in a rather unusual (read: horrible) place when it comes to strong out of band signals. There aren’t many hand helds around able to handle these. Only monoband HT’s like the Yaesu VX-177 (replaced by the FT-277R) and Icom IC-U82 don’t care. I’ve never tried to use the VOX function for other purposes. Great review! I recently became active again on the Amateur Bands after a couple years hiatus and needed an HT to compliment my HTX-242 2m mobile rig. Your review was key in my decision to pick one of these up. Keep up the Blog and fine work! How does one access the secondary key-pad functions on the 5 RA? I don’t see it in the manual. They aren’t secondary really. Just press menu and the key on the keypad. [Menu] + 2 will access the TX Power option, for example. So when you set up a frequency with the offset and the tone you need and want to save it you press menu then 3/save ? Is that correct? I’m slowly starting to think that we’re not talking about the same. I’m talking about menus, and you seem to be talking about the underlying parameters. If so, take a look at http://uv5r.99k.org/ – all questions will be answered here. This is Rex from Taiwan who so far works at a lab and now helping our client to debugging a harmonic issue which occurred on UV-5R, it looks same as UV-3R, so, may I have your great support to solve it? Your great support will be highly appreciated. I probably can’t help you with that. The UV-5R is actually quite good at harmonic suppression out of the box. What are the numbers? I might be just that one radio, did you check other samples? These radios don’t allow much tuning or tinkering. The SDR principle is responsible for that. thank you for taking the time to review this and other radios. I do appreciate the work (fun) that you have put in for the good of our hobby. All UV-5R versions are technically the same, only the looks are different. Just pick one you like the most. Even sellers like 409shop mention this in a FAQ, so it’s not really a secret. The transmit audio deviation setting varies quite a bit from radio to radio. Some work great, others have moderate to extremely low deviation. I have sent repeated requests to the factory looking for a solution and did not receive a response to any of my emails. The type acceptance file on the FCC’s database implies that they wish to keep the alignment procedure a trade secret. I assume it is done via software. It would seem that, given the number of complaints about low audio that are posted on internet that maybe they would release a “Deviation Adjust Only” utility to allow owners to deal with this issue. The radio is totally awesome for what it costs of your particular radio works, but if the deviation is excessively low the only thing you can realistically do is throw it away like a loosing lottery ticket and buy another one to try again. 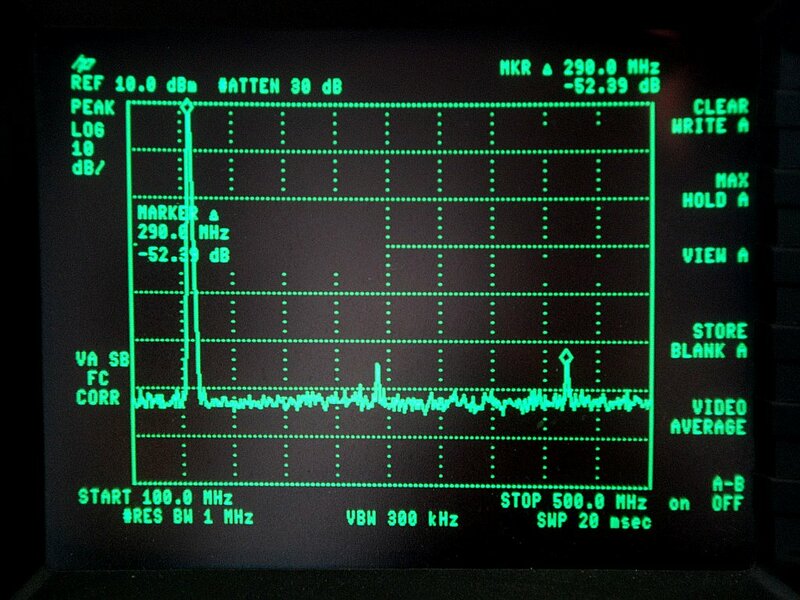 Deviation is fine when measured on test equipment, but TX audio level is low. Both are different things. Remco PA3FYM cooked up a mod to amplify TX audio by using the VOX circuitry. You are right about software; all these radios are SDR-based designs. I bought a Beaofeng UV-5R. I saw that many parameters were modified during demonstrations. So I made a reset (menu 40) “all” to the original factory values. To my astonishment it started to talk Chinese. There was no indication in the “manual” how to chose English again. Sombody has a sollution? Menu 14 gives you 3 choices: English, Chinese and Off. Thanks for you great wbe guide to use the UV-5R ….very great !!!! Sorry i read some Ham’s say for the UV-5 this “big” problems…..
1)	Squelch not function well, if set “1” not received …. Its true this ? 2)	Idem the regulation of the volume know or too low or too high ? 3)	Random sometimes it not work, all is ok but not received nothing ? bug or ? 4)	Battery Charger its true that “cooking” and damage the battery ? Its real a very BAD radio ? and have real all this big problems? I buy or not this china rtx ? HANS please help me …. is ok for the UV-5 ??? if i buy it what programma i download and the driver for win xp ? where ? I am trying to program a new repeater in my Beaofeng UV-5R, but I keep getting lost. I would like to safe it as Ono as the repeater is located in Kiryat Ono near Tel Aviv, but I wouldn’t like to erase one of my other repeater frequencies. For the UV-5R, How does one get a channel name to appear on the display? Only by using Chirp or Baofeng software. Can’t be done manually, unfortunately.